In 2004, the rover Opportunity landed on Mars. Originally intended to serve a mere 90-day mission, the rover instead beamed back scientific discoveries for 15 years. But since a massive dust storm in 2018, the rover Opportunity ceased sending data—and now, NASA has declared its groundbreaking mission complete. (Its twin rover, Spirit, ended its mission in 2011.) 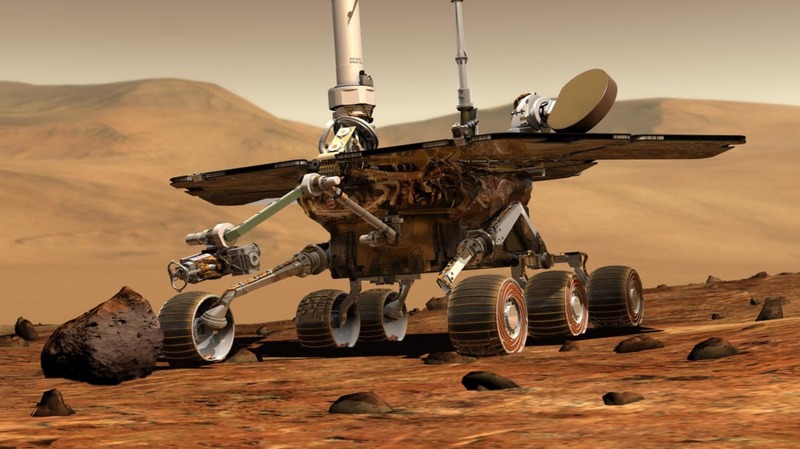 Opportunity is the longest-serving robot ever sent to another planet. Let's celebrate Opportunity's Mars mission with a look at the images it captured. 1. Opportunity rover gets its first 360° shot. This 360° panorama, comprised of 225 frames, shows Mars as it was seen by the Opportunity rover on February 2, 2004. You can see marks made by the rover's airbags, made as Opportunity rolled to a stop. Here's a larger version of the photo. 2. Opportunity rover finds a meteorite. This meteorite, found by Opportunity on January 19, 2005, was the first meteorite ever identified on another planet. 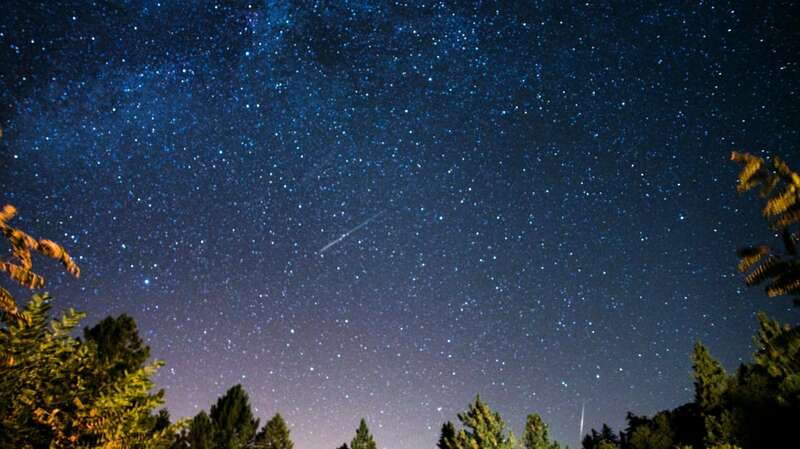 The rover's spectrometers revealed that the basketball-sized meteorite was composed mostly of iron and nickel. 3. Opportunity rover shoots the Erebus Crater and drifts. On October 5, 2005—four months after Opportunity got stuck in an area NASA nicknamed "Purgatory Dune"—the rover skirted wind-deposited drifts in the center of the Erebus Crater, heading west along the outcrop (the light-toned rock) on the crater's rim, and snapped this photo with its PanCam. 4. Opportunity rover captures Martian rock layers. Located on the western ledge of the Erebus Crater, this ledge—called "Payson"—has a diverse range of primary and secondary sedimentary layers formed billions of years ago. According to NASA, "these structures likely result from an interplay between windblown and water-involved processes." Opportunity snapped this photo on April 5, 2006. 5. Opportunity rover comes to Cape Verde. On October 20, 2007, Opportunity celebrated its second Martian birthday (one Martian year = 687 Earth days) by snapping this photo of Cape Verde, a promontory that juts out of the wall of the Victoria Crater. Scattered light from dust on the front sapphire window of the rover's camera created the soft quality of the image and the haze in the right corner. 6. and 7. Opportunity rover is hard at work on Marquette Island. This photo shows Opportunity approaching a rock called "Marquette Island" on November 5, 2009. Because its dark color made it stick out, the rover team referred to the rock—which investigations suggested was a stony meterorite—as "Sore Thumb." But it was eventually renamed, according to NASA, using "an informal naming convention of choosing island names for the isolated rocks that the rover is finding as it crosses a relatively barren plain on its long trek from Victoria Crater toward Endeavour Crater." 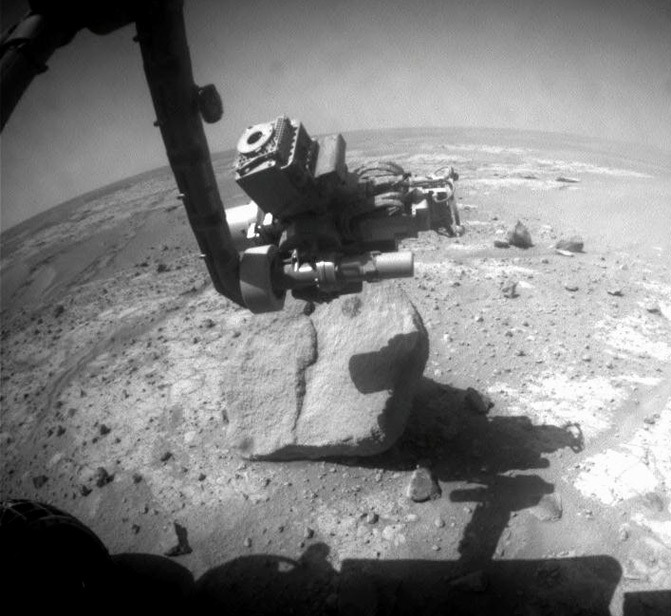 On November 19, 2009, the rover used its rock abrasion tool to analyze a 2-inch diameter area of Marquette, which scientists called "Peck Bay." 8. Opportunity rover encounters SkyLab Crater. Opportunity snapped a photo of this small crater, informally called Skylab, on May 12, 2011. 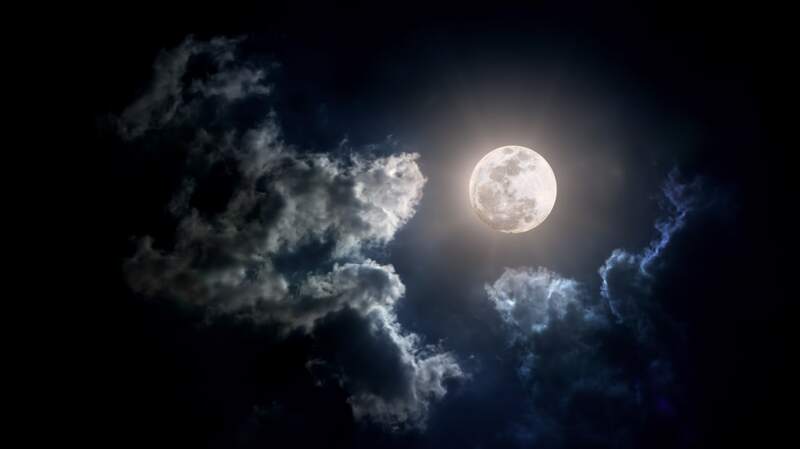 Scientists estimate that the 30-foot crater was formed within the past 100,000 years. Click the photo for a larger version. You can also see the crater in stereo if you have a pair of anaglyph glasses! 9. Opportunity rover sees its shadow. On its 3051st day on Mars (August 23, 2012), Opportunity snapped this photo of its own shadow stretching into the Endeavour Crater. 10. Opportunity rover sees its first dust devil. Though its twin rover, Spirit, had seen many dust devils by this point, Opportunity caught sight of one for the first time on July 15, 2010. 11. Opportunity rover snaps a selfie. A girl sure can get dusty traversing the Martian plains! Opportunity snapped the images that comprise this self-portrait with its panoramic camera between January 3 and January 6, 2014, a few days after winds blew off some of the dust on its solar panels. The shadow belongs to the mast—which is not in the photo—that the PanCam is mounted on.